This year, Bali celebrated Galungan on 15 July. The beginning of a 10-day holiday festival, one of the most important on the Balinese Hindu calendar, it is the time when the spirits of the departed visit their relatives and the places they knew and loved. It concludes on 25 July, when, having been feted with food and colourful offerings, they return to heaven for another year. Symbolically, Galungan marks the victory of Good, known as Dharma (not the one with Greg, the other one) and Evil, known as Adharma. If it’s at all possible, Balinese travel back to their villages; businesses close as do many shops, bars, cafes and restaurants, even in the tourist areas. Needless to say, the few cafes opening to a hungry clientele on Galungan morning were besieged. There wasn’t much happening at Batu Belig, aside from one place I’d already tried and wasn’t wildly impressed by, so I continued south towards Oberoi and Seminyak Square. On the way, I passed Petitenget, a long-time favourite of mine; it was the first eatery I fell in love with upon arriving in Bali early last year. Somewhat of an expat hangout (definitely a better class of expat), Petitenget has a compelling menu, very reasonable prices, excellent wines that don’t cost the Earth and the bar staff can even be relied upon for a seamless martini, should the whim take you. When I want to show visiting friends some of my favourite Seminyak things, Petitenget (along with the nearby Motel Mexicana and Merah Putih) are top of my list. And while I call the menu compelling, I really should qualify that by saying that, despite my best efforts and a determination each time to order the slow-braised lamb shoulder or pork belly or even the Black Angus striploin, overwhelmingly I end up with the risotto of Balinese duck, irresistibly rich with wild mushrooms, spinach, shaved pecorino and truffle oil, a vast bowl that seems to be at least half duck. It’s that good. Petitenget’s website promotes the “farm-to-fork” philosophy of Executive Chef Simon Blaby, who previously worked at such resorts as Karma Kandara and Semara. The restaurant’s organic farm at Kintamani, in Bali’s north, produces about 80 per cent of the produce used in the kitchen. Anyway, long story slightly less long is that it took me until that morning, well over a year since my arrival, to discover that Petitenget serves breakfast. The Universe was delivering me to that door (or the steps from the street that I always seem to trip up) so it would be ungrateful not to go inside. Despite the place being packed, the Universe also provided the last unoccupied table, which I immediately commandeered. 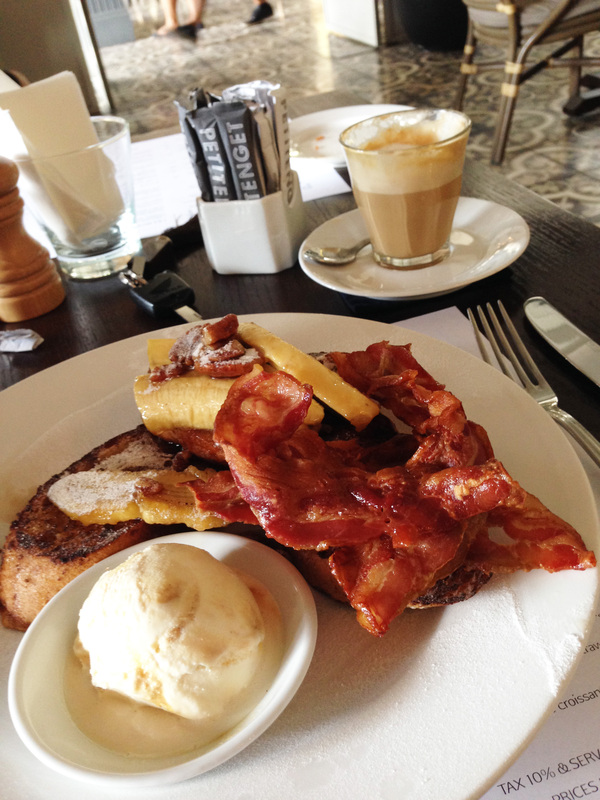 The breakfast menu was extensive and certainly had enough choices to provoke a certain consternation but I eventually chose the French toast with caramelised banana and a generous side of bacon. Figuring the crowd of diners would slow the kitchen down a bit, I settled in with a strong latte and a newspaper. But far quicker than anticipated, my order arrived. And every bit as memorable as the duck risotto, I’m pleased to report. Then, as I usually do with new breakfast locations, I ordered a macchiato. It was a little over-milked but tasty, with no trace of bitterness. The boxes just keep being ticked at Petitenget. 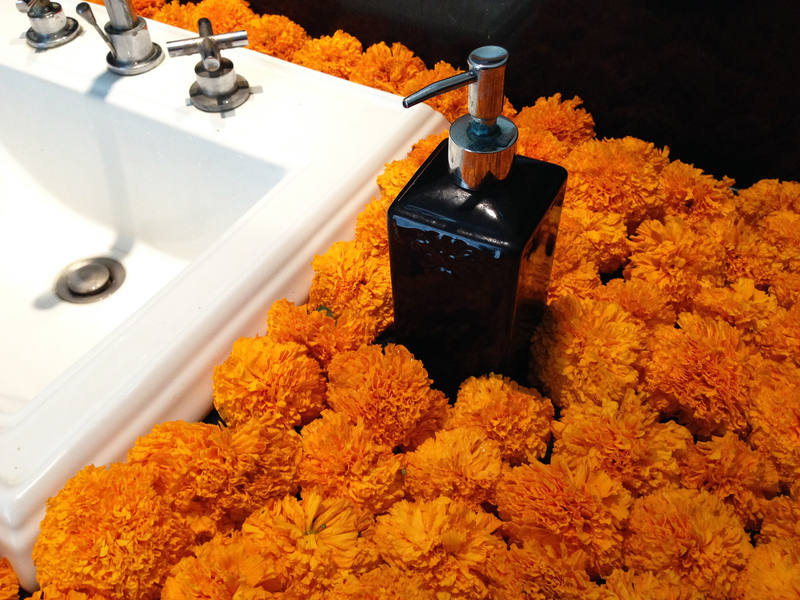 On the way out, I popped into the men’s room where the counter top was wreathed in bright marigolds. I’m not sure whether this was a nod to Galungan but the marigold, known locally as gemitir, is commonly used in offerings. Every day, countless thousands of canang sari can be seen throughout Bali. The canang is a tray made from a palm leaf. 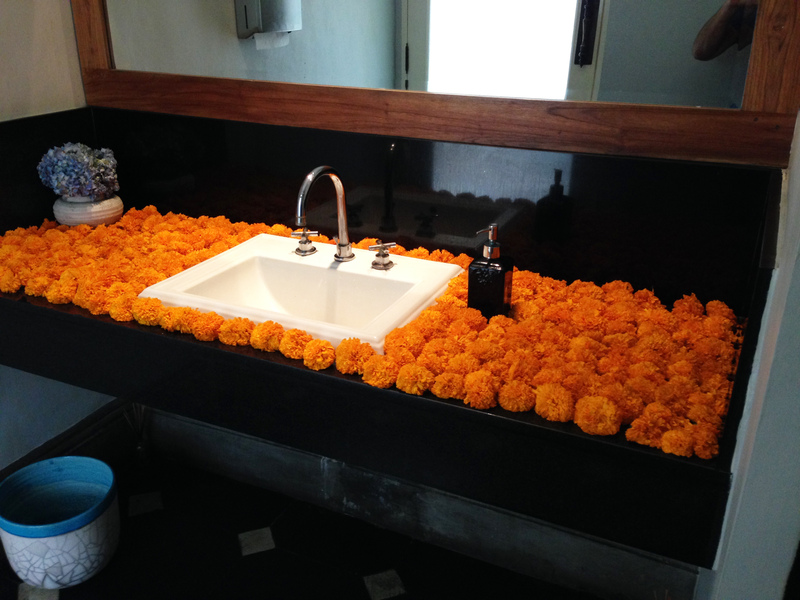 The sari may include rice, incense, money and always a flower of a particular colour; the burnished yellow of the marigold, aligned towards the west, symbolises the Hindi deity Mahadeva. Just like dinner, breakfast at Petitenget is not an everyday choice. But for those times when you want something very special, it’s certainly a worthy option. And, unlike Galungan, it doesn’t have to be once a year. Petitenget, Jl Petitenget No. 40X, Seminyak. Tel: (62 361) 4733 054. Words and photos copyright David Latta 2015. Bali + The Creative Sojourn Blog at WordPress.com.